By the mid-16th century, enthusiasm for the centralized plan as the ideal form for liturgical buildings was waning. After the Council of Trent, Counter-Reformation tendencies within the Catholic Church began to advocate a return to the basilica type. The Gesu (1568-71), the mother-church of the Roman Jesuits, designed by Jacopo Vignola (1507-73), combined both longitudinal and centralized schemes, while its monumental dome served both as a visual climax and as an allusion to the symbolic journey of the soul towards God, which begins below in the nave. Elsewhere, Vignola varied the centralized type, providing the church of Sant'Anna dei Palafrenieri (c.1570) with an oval rather than circular ground plan, a device that remained popular through the 17th century. 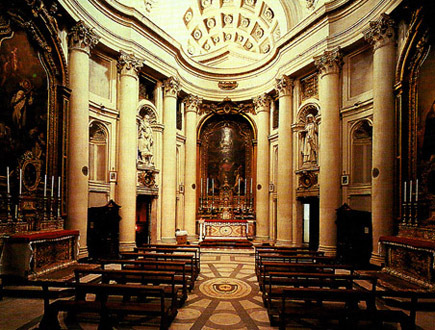 Baroque church architecture tends to stress either the longitudinal axis, formed by the pathway from the entrance to the altar, or the vertical axis formed by the altar and the dome, with increasingly daring effects. This was the case at St Peter's when, in 1607, Carlo Maderno (1556-1629) added a nave and aisles to Michelangelo's centrally planned church. Borromini was later to create dramatic tensions in his interior spaces by drastic variations of scale, while the Turinese engineer and architect Guarino Guarini (1624-83) rejected the idea of a dome as an enclosing bubble by accentuating certain sections left open to reveal a complicated play of light. Domes also became important features in the urban landscape. In designing the church of Santa Maria della Salute (1631-48) in Venice, Baldassare Longhena (1598-1682) recognized the group of domes of St Mark's as a model for developing a new emphasis on exterior spaces. At the Roman church of Sant'Ivo alia Sapienza (1642-62), Borromini gave an overall unity to the scheme by mirroring the ground plan in the outline of the base of the cupola; as the dome rises, it transforms into a perfect circle, while the decorative motifs suggest a continual acceleration of the upward movement of its structure. Guarino Guarini, San Lorenzo Turin, cupola on octagonal base, 1668.
view of the interior 1638-67. Guarino Guarini, San Lorenzo, Turin, interior of dome. 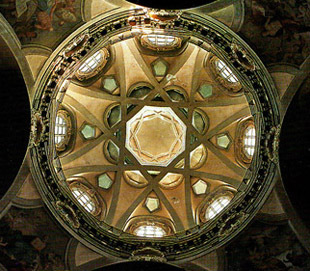 Guarini also designed the dome of the Chapel of the Holy Shroud in St John's Cathedral, Turin. In Baroque architecture in general and in ecclesiastical buildings in particular, the facade was extremely important, acting as the element of mediation between internal and external spaces. In Rome, this idea can be traced back to the late 16th-century church of the Gesu. 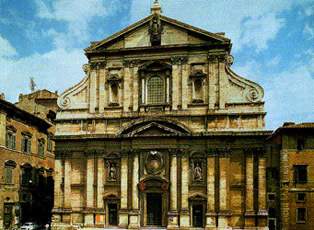 the facade of which was designed by Giacomo della Porta (1533-1602). It is bi-partite. with a strong central axis, emphasized by the double tympanum and portal. During the 17th century, church facades became increasingly important in urban areas. Pietro da Cortona's Santa Maria delta Pace (1656-57) has an emphatically projecting portico, while the movement in the convex upper section is countered by the flanking walls that curve back to form a fan-shaped space. Bernini reinterpreted Cortona's ideas in Sant'Andrea al Quirinale (1658-61), where the interior and exterior are linked by the exetlra, or colonnade, while the convex pronaos, or projecting porch, invites the passer-by in. These features are repeated inside the church, marking the boundary between the oval space for the congregation and the main altar. Alternating concave and convex walls were also used by Francesco Borromini for San Carlino alle Quattro Fontane (1667). His facade is like a theatre curtain revealing playful, illusionistic scenery, and provides a taste of what was to come in the 18th century. The many churches built after the Sack of Rome in 1527 and through the High Baroque period lend harmony to Rome's townscape. 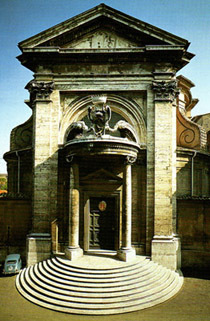 Giacomo della Porta, facade of the Gesu. Rome, 1568-71. (b Naples, 7 Dec 1598; d Rome, 28 Nov 1680). Sculptor, architect, draughtsman and painter, son of Pietro Bernini. He is considered the most outstanding sculptor of the 17th century and a formative influence on the development of the Italian Baroque style. His astonishing abilities as a marble carver were combined with an inventive genius of the highest order. From the mid-1620s the support of successive popes made his the controlling influence on most aspects of artistic production in Rome. Although his independent works of sculpture, both statues and portrait busts, are among the most brilliant manifestations of their kind in Western art, his genius found its highest expression in projects in which he combined sculpture, painting and architecture with scenographic daring and deep religious conviction to express more fervently than any other artist the spiritual vision of the Catholic Counter-Reformation Church. Gianlorenzo Bernini, design for the new facade of the Louvre, first proposal, 1664-65. Musee du Louvre, Paris. 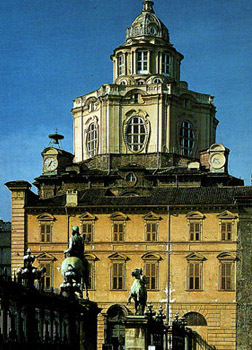 The most important aristocratic residence to be built in Rome during the first half of the 17th century was the Palazzo Barberini, designed during the reign of Pope Urban VIII. In 1626, the project was entrusted to Carlo Maderno and it was completed after his death by Bernini, assisted by Borromini (1630-32). Its H-plan was inspired by the traditional layout of country villas; the courtyard, flanked by two short projecting wings, introduces the central block, which has an open loggia and entranceway placed on an axis with an oval space that leads out to the garden. Despite being innovative, the design "was not imitated for some time in Rome. On the contrary, great emphasis was laid on the facades of city buildings, as occurs at the Palazzo di Montecitorio, designed by Bernini for the Pamphili family (1650-55). Its long facade is in five sections, with a projecting central portion and slanting lateral wings; the pilaster bases and window cornices look as if they have been hewn out of rock. The entablature of the portal was originally supported by pairs of telamonic figures (later removed by Carlo Fontana), a motif that was to be widely used in High Baroque architecture in Austria and Central Europe, especially by Johann Bernhard Fischer von Erlach (1656-1723). An even more influential design was Bernini's facade for the Palazzo Chigi in the Piazza Santi Apostoli. The central projecting section of the front elevation has pilasters on high bases and is framed by two lateral wings; it is emphasized by a large projecting cornice and balustrade. This design is echoed in Vienna in the Liechtenstein Palace, on which Domenico Martinelli (1650-1718) started work in 1692; the city palace of Prince Eugene of Savoy, 1696; and the Schonborn-Batthyany Palace, both by Fischer von Erlach. The plan of the Barberini palace was exported to France when Bernini was summoned to Paris in 1665 to submit designs for the enlargement of the Louvre. His first proposal comprised two grand salons, one above the other, giving their shape to the central oval from which, on the exterior, two concave wings project. 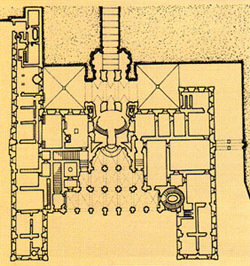 This scheme, derived in spirit from Borromini, was not approved. In his next design, Bernini envisaged a massive block with slightly protruding corner-stones set on a base hewn to resemble a reef emerging from the sea, in complete contrast to the austere lines of the building itself. Work began on this project in 1665, immediately after Bernini's return to Rome, but soon came to a stop. A commission formed by Charles Le Brun (1619-90), Louis Le Vau (1612-70), and Claude Perrault (1613-1688) successfully argued for the adoption of classicism as the canonical French artistic style, in preference to copying Italian taste. As a result, a colonnade was added to the eastern facade of the palace in homage to the architecture of classical antiquity. Unlike the Italian palazzo, the French hotel particulier was connected to the street by a half-open courtyard, or cour d'honneur. The living quarters, or corps de logis, were set further back. As the century progressed, the hotel generally became a U-shape around the courtyard, cut off from its urban environment as in Jean Androuet Du Cerceau's Hotel de Sully (1624-29) in the Marais district of Paris. The courtyard of the Hotel Lambert (1640-44), built by Louis Le Vau on the He Saint-Louis for Nicolas Lambert, was surrounded by a continuous Doric entablature, giving a sense of continuity to the space, reinforced by the gently curved concave corners at both ''ends" of the facade. 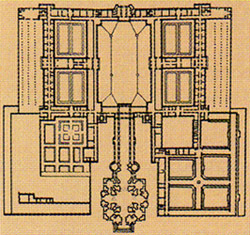 Plan of the Palazzo Barberlnl, Rome. 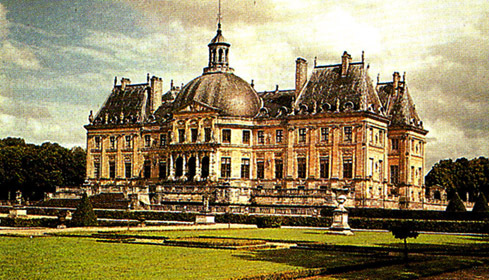 Louis Le Vau, Chateau Vaux-le-Vicomte, 1657-61.
was built for Nicolas Fouquet, Louis XIV's chief minister. Carlo Maderno (1556-1629) was a transitional artist who bridged the styles of Mannerism and Baroque in Rome. 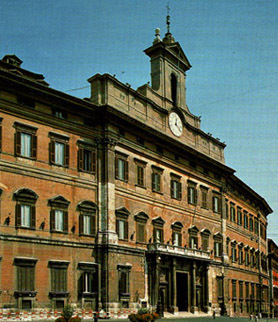 A nephew and pupil of Domenico Fontana, he designed the facade of Santa Susanna (1595-1603). He was appointed by Pope Paul V as architect to St Peter's and designed its facade and nave, adopting a basilical plan contrary to Michelangelo's intentions. Gianlorenzo Bernini, facade of Palazzo di Montecitorio. Rome, 1650-55. Hall of Mirrors, Palace of Versailles, 1678-84.
changing Le Vau's earlier plan. Versailles is the key expression of 17th-century absolutism and epitomizes the ethos and taste of Louis XIV's reign. It was adopted as a model by other monarchs throughout Continental Europe until the end of the 18th century. 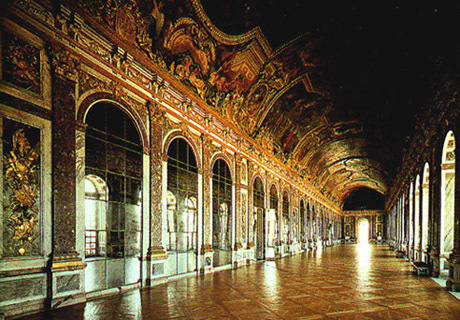 Work began at Versailles in 1661, building around the nucleus of a hunting lodge constructed by Louis XIII in 1624. Louis Le Vau was responsible for the project and designed the central section of the new palace, the two wings forming the courtyard, and the garden facade. When the king decided to move the royal court and government to Versailles in 1677, Jules Hardouin-Mansart was commissioned to enlarge the palace, adding the vast entrance courtyard and two immense wings north and south of the central block. From the outset, the palace was envisaged as the fulcrum of an urban system set in a landscape that appeared to stretch to infinity. Andre Le Notre, in charge of the king's parks and gardens after 1662 and the inventor of the "French garden", drew on the Italian tradition of symmetry for his network of axial pathways. Designed to appear endless, they are punctuated by unexpected pavilions, clipped trees, and open spaces. In this way, Le Notre increased the sense of space and scale, emphasized by steps, terraces, large expanses of reflecting water, and spectacular fountains. The palaces interior decoration, under the charge of Charles Le Brun, represents the peak of virtuosity in French Baroque art, especially Hardouin-Mansart's Hall of Mirrors (1678-84). Louis Le Vau, Palace of Versailles, garden facade, 1661-90.
almost more of a king s city than Paris itself. Hotel des Invalides, Paris, plan of the whole complex, 1670-1706. Created as a home for war veterans, the building had to express the ideas of grandeur and sovereignty that inspired Louis XIV's military campaigns. 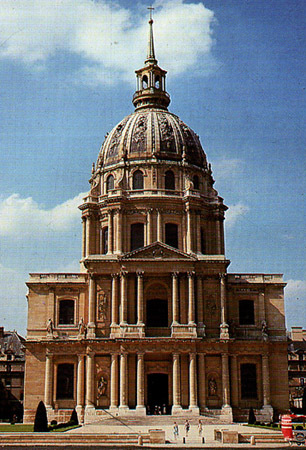 Jules Hardouin-Mansart was commissioned by Louis XIV to build a new chapel (1680-1706) among the existing buildings of the Hotel des Invalides military hospital and home for war veterans (1670-76). It is constructed on the main axis of Les Invalides, with an oval sanctuary added to a central plan. It is topped by a dome inspired by Michelangelo's cupola of St Peter's in Rome, although this French version is considerably taller. The windows of the lower drum, separated by pairs of columns, illuminate the interior, while also supporting the first masonry ceiling. The windows of the second drum light the space between the first dome and a second one. visible through the wide central aperture of the spheroidal vault beneath it. A third, lead-covered dome forms the outer shell and is topped by a lantern ending in a pinnacle inspired by the Gothic tradition. Mansart's plans also included two quarter-circle wings, adapted from Bernini's designs for St Peter's Square, but these were never built. Construction of Les Invalides coincided with almost the entire period of Louis XIV's military campaigns (1667—1714) through which he sought to dominate Europe. Jules Hardouin-Mansart, Church of the Invalides, Paris, 1680-1706. In the 17th century, convenience and comfort became increasingly important in French private residences and especially in the hotels particuliers. This led to the introduction of rooms of various sizes for specific uses: the antichambre, a waiting room and, at times, dining room; chambre de parade, a reception room; chambre a coucher, a bedroom; the cabinet, a study for work and receiving business visitors; and the garderobe, or privy. Grander houses would also have had a salon and sometimes a gallery, An earlier arrangement of interconnecting rooms en enfilade was generally abandoned in favour of appartements doubles. In royal residences, the king would often receive state visitors in his bedchamber, which was fittingly decorated with sumptuous stuccowork, gilding, and painting. The royal bed was placed in an alcove, separated from the rest of the room by a low balustrade. Later on, doors were installed behind the alcove, leading to the most private boudoir, or dressing room.